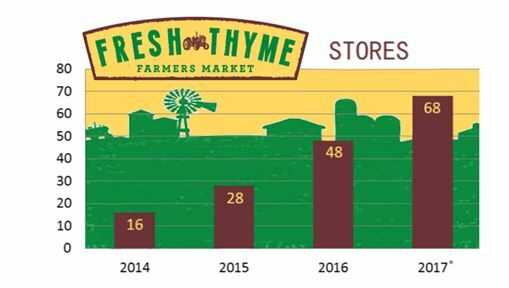 Serving the Midwest, Fresh Thyme Farmers Market plans to open 20 new locations in 2017 to follow up its efforts in 2016, a year in which it also opened 20 stores. Its (growing) selection of private-label goods and pricing have more in common with Trader Joe’s than Whole Foods, the other point of comparison for any banner in the natural and organic grocery market. Although both companies are extremely reticent to discuss the exact nature of the investment, Meijer Inc. does in fact own a majority Fresh Thyme, which means the 5-year-old chain headed by former Sprouts CEO Chris Sherrell has the deep pockets needed to continue on its current growth trajectory. 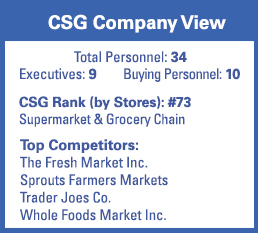 Source: Chain Store Guide Database of Supermarket, Grocery & Convenience Store Chains. *Projections based on company statements. Actual figures are subject to change. This data is not intended for investment decisions.